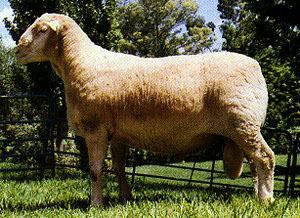 This unique South African white wooled mutton sheep breed is considered to be a dual purpose breed. Developed from a small nucleus of German Merino sheep, it has adapted to most environmental conditions of South Africa. Bred specifically to produce a slaughter lamb at an early age (35 kg at 100 days of age) but still being able to produce good volumes (4kg) of medium to strong wool. Lambing percentages in excess of 150% are common and the ewes have ample milk to raise the healthy well-grown lambs. The SA Mutton Merino is a polled breed with the rams having mature masses of 100-110 kg (~220-245 lbs) and the ewes having mature masses of 70-80 kg (~155-175 lbs). Copyright © 1996. Oklahoma State University Board of Regents. All rights reserved.